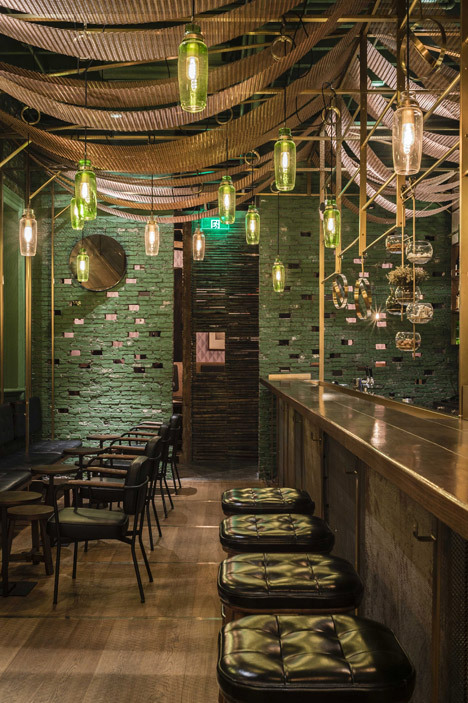 Chinese studio Neri&Hu has added bamboo-lined booths and green glass lampshades to a Shanghai bar that specialises in one drink – punch (+ slideshow). 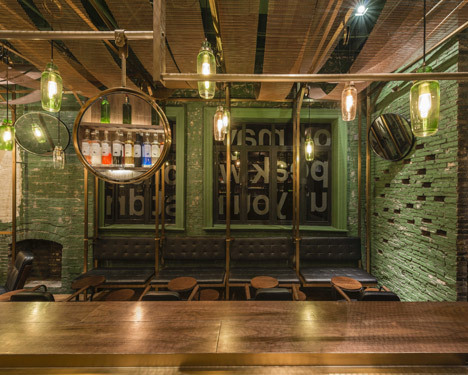 Architects Lyndon Neri and Rossana Hu used reclaimed timber, bottle-green glass and blackened bronze piping to recreate the feeling of a back-alley bar for Punch, a 155-square-metre space located in the Jing'an district of the city. The bar is housed inside an existing building, at the top of a flight of stairs. 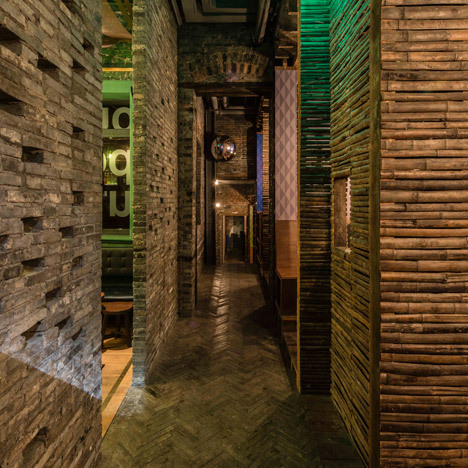 A narrow passageway leads from the entrance into the L-shaped space, which is divided into two areas – a bar with a 60-person capacity at the front on the left and a series of booths arranged along the right hand side of the passage for more intimate gatherings. "This entry corridor is envisioned as an alleyway, not unlike those that define Shanghai's old urban fabric – an exhilarated blurring of public and private spaces and an intersection of communal and domestic activities," said Neri and Hu. 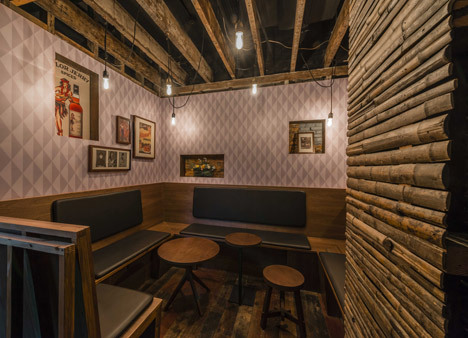 The booths and toilets located on one side of the bar are lined in a mixture of stained grey brickwork, graphic wallpaper and lengths of split bamboo. "Timber framing mimics the construction of traditional houses," said the pair, "while decorative elements – custom-designed wallpaper, framed graphics and found objects – contribute to a sense of nostalgia and humble domesticity." 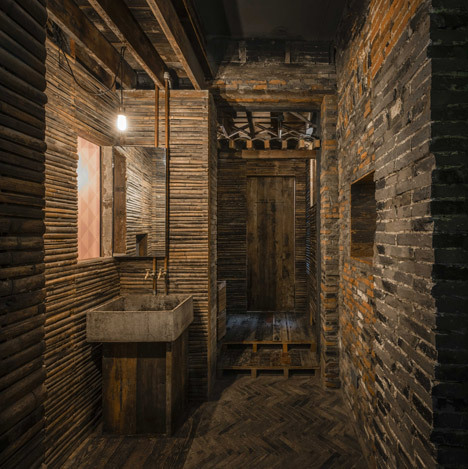 Pieces of reclaimed timber are laid in a zigzag pattern across the bathroom floors, and a copper tap spouts water over a reclaimed sink in the adjoining hallway. 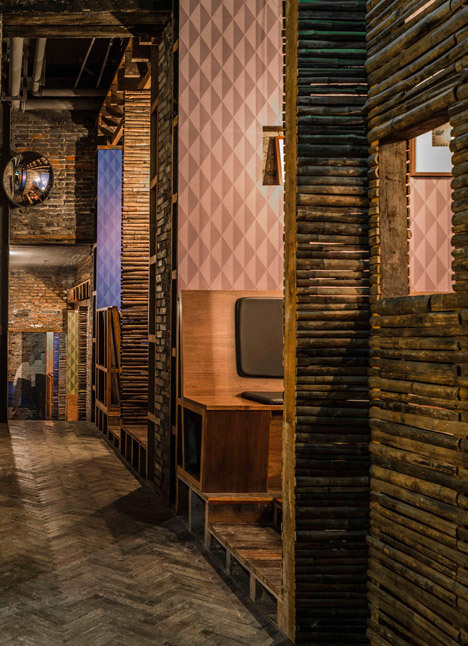 "The restrooms at the end of the corridor feature a solid concrete sink that is modelled after those frequently found in Shanghai alleyways for communal use," explained the designers, "a tribute to the fast-disappearing vibrancy of traditional lane house living." 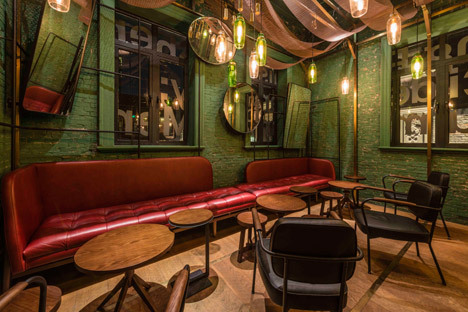 A bar made from walnut wood and surrounded by blackened bronze piping is located in the more open bar space on the other side of the corridor. The bar specialises in variations of punch – a beverage made from a cocktail of aromatic and alcoholic ingredients – whose popularity the architects attribute to employees of English trading business the East India Company. 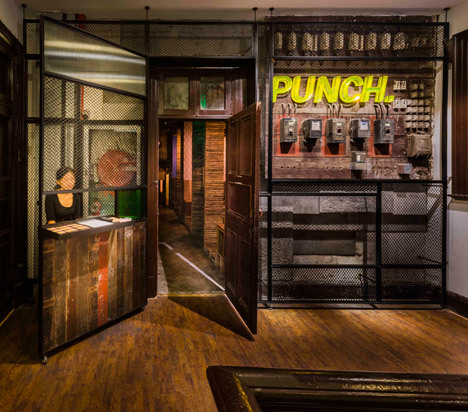 "Brought from India to England by seamen and employees of the British East India Company, punch evolved from home-brewed recipes in the 15th century to become a popular sailor's drink in the 17th and 18th centuries," said Neri and Hu, "and has since then been elevated yet further to be served at elite social events." "The word 'punch' originates from Sanskrit word panch, meaning 'five'," they added, "since the drink was originally made with just five ingredients: alcohol, sugar, lemon, water, and tea or spices." Ingredients for the beverage are sorted into strains below signage reading "liquor, citrus, spice and sugar" behind the bar. 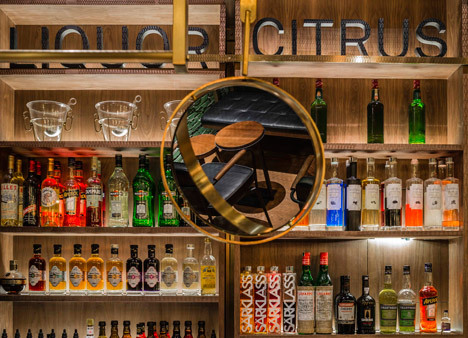 Circular mirrors affixed to bronze framework above the bar reflect the glassware and liquor bottles. The studio also designed glassware and furniture for the space including punch bowls and glasses, wine carafes and wooden chairs. Pendant lights with bottle-green shades shaped like the tapered flute of a champagne glass hang from the ceiling, which is also draped with lengths of fabric. 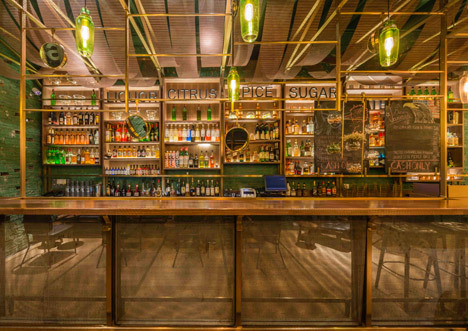 A perforated brick screen between the main bar and foyer is painted a matching green. The bespoke lighting, coupled with leather upholstery and oak floorboards, is intended to give this side of the bar a more upmarket appearance. 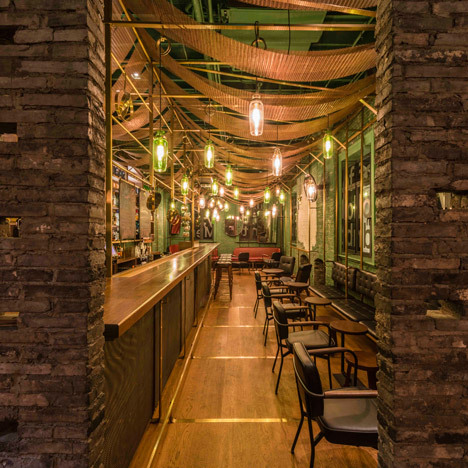 "Contrasted with the darker, more intimate spaces of the alley, the public hall on the opposite side celebrates punch-drinking as a glamorous and sophisticated affair," said the architects. "Strategically placed mirrors, glass and reflective surfaces build intrigue and theatricality, allowing unexpected views and moments of surprise and delight."